A Tray for Two Wine Basket says, two's company, three's allowed. 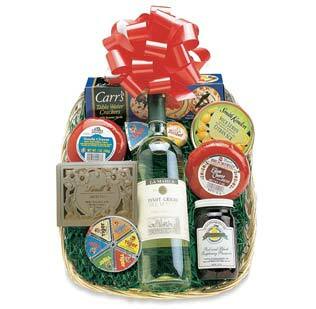 A beautiful bottle of fine wine is the centerpiece for this enchanting Tray for Two gift basket. Pemberton's attractive, reusable wicker tray is brimming with imported and domestic cheeses, Pemberton's homemade jelly, unique crackers and fine candy. It's perfect for a party of two, three or even four. Want to Send Champagne instead? Order the "Tray for Two with Champagne" listed below.